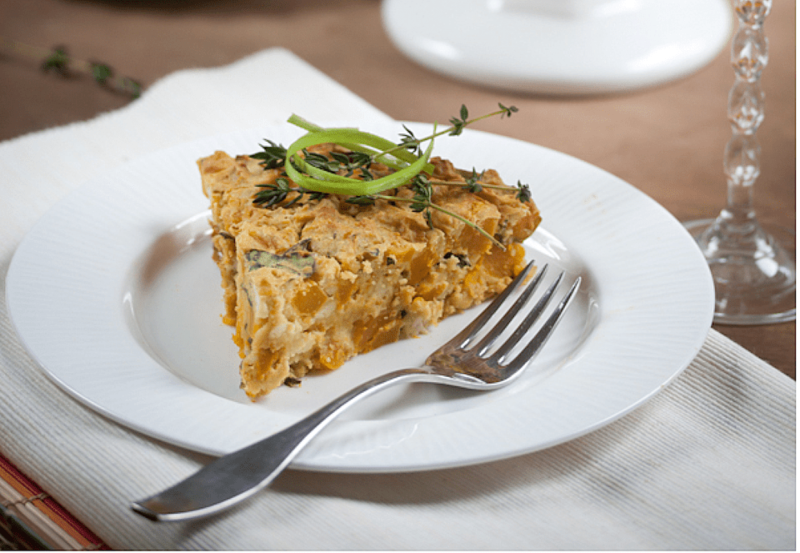 This pumpkin quiche is a delicious start to an autumn weekend morning and a great way to take advantage of pumpkin season! It also makes an easy dinner for a chilly evening when accompanied with a large dinner salad or a piping hot bowl of soup. For vegans, this makes a wonderful main course to serve during the holidays or anytime sugar pumpkins are in season. Chopped collard greens add a touch of color (and goodness!) to this seasonably orange dish. Feel free to substitute your favorite winter squash for the pumpkin used here. Butternut, acorn, and even kabocha work beautifully in this recipe. You can make this recipe up to 3 days ahead of serving time; simply prepare, and then store in an airtight container until ready to serve. Reheat or serve chilled for an effortless meal. Drain the water from the package and wrap tofu in paper towels or clean kitchen towels. Place tofu between two large flat plates and then set a heavy can or jar on top of the top plate to weigh down. Allow to rest for at least 30 minutes and then replace the paper or clean kitchen towels. Repeat until almost all water has been absorbed from the tofu. You can also use the gadget, the tofuxpress, for easy and fast tofu pressing. Place the pumpkin onto a baking pan cut side up. Sprinkle gently with sea salt and then flip over so that the flesh is facing down. Add 1/4 cup water to the baking pan. Bake for 45 minutes to 55 minutes or until the flesh of the pumpkin is tender. Decrease the oven temperature to 350 F and lightly grease a standard-sized pie pan. In a large mixing bowl, whisk together the besan, 1 cup water, 2 teaspoons salt, and baking powder until very smooth. Crumble in the tofu and, using a spoon, stir well to combine breaking up any large chunks of tofu. Bake in oven for 70 to 75 minutes or until top is golden brown. Let cool at least 30 minutes before slicing.